I’ve been excited about DC Universe: Rebirth in a way I haven’t been excited in a comic in a while. Of course, there have been new series I’ve been excited to check out, and the latest chapters in comics I consistently love, both of which have me eager to get to my comic shop on a Wednesday, but this was a different type of excitement. This was the kind of anticipation I felt going into the first issues of Infinite Crisis, Final Crisis, Blackest Night, the best kind of event comics where you know as you start that you’re about to read something huge and epic. When this was announced, I was certainly intrigued, but it wasn’t until the release was impending that I realised just how ready I was for a comic like this. And it delivered on my high expectations. There is plenty I’ve liked about the New 52. But one of my regrets of the whole thing, five years on, was how much of the DC Universe’s history was lost. Yes, yes, I know, the comics on my shelf didn’t burst into flames so I can never read them again just because they were no longer canon. But comics like The Multiversity served as a reminder of how much I loved the DC Universe in all its bonkers complexity, rewritten timelines, legacies and death/resurrections included. And suddenly this old, lived-in universe with decades of accumulated gravitas was new-car shiny and fresh. Superheroes had only been around five years, everyone was younger, and a lot of the big events in these characters’ history, along with many of the great friendships, rivalries and romances, had never come to pass. It was always a controversial decision, but whether you were in support or opposition, I imagine that all DC readers were sad about at least one thing they loved no longer factoring into the stories they would read going forward. If you felt that way to any degree, this is the comic for you. It’s not regression, as some feared. It’s not lashing out against diversity or progress. It’s not retconning the New 52 out of existence. This 80-page special (and for $2.99, that’s a hell of a deal!) gets off the ground running with a simple adjustment to the premise, but one with catastrophic implications that, I think, makes the whole thing much better. The New 52 isn’t just something that happened to us, the readers, at an editorial level. It is something that happened to the characters, within the world of the story. This is no longer a case of the characters are just now 10 years younger, and many of the experiences and relationships that defined them never happened. This is a case of these characters having those years, experiences and relationships stolen from them. And so, on some level, even if they can no longer remember it, all the stuff that happened to them before still happened. The agent for conveying all this to the reader is none other than Wally West. Not the teenage Wally West of the current comics, the pre New 52 Wally West, the former Flash. This was one of the big reveals of this comic that was spoiled for me beforehand, and I think the commentary about it that I caught took his appearance in the wrong context. There has been discussion about how the restoration of this old Wally West was about catering to the latent racism of fanboys, that the only possible reason people could want this Wally West back was that they didn’t like the new version being black. I don’t think that’s the case at all. Oh, of course, I’m sure there are some mouth-breathers out there who hated Wally being made black. But for me at least, my sadness over the loss of “my” Wally West was much more down to the history I’d shared with him. 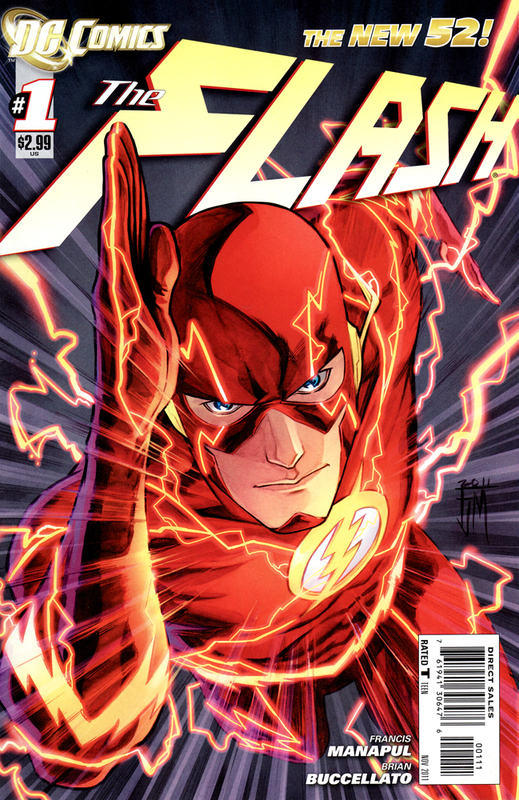 It was the Geoff Johns/Scott Kollins run on The Flash – with Wally in the mantle – that turned me from a Batman fan into a DC Universe fan, not to mention making me love the mythos of The Flash. Barry Allen being restored into the role was a tough pill for me to swallow at first, and really it took a combination of the beautifully illustrated Francis Manapul/Brian Buccaletto run on The Flash’s New 52 launch and the excellence of the TV series and Grant Gustin’s performance in it for me to finally fully embrace Barry Allen back in the role, not to mention Barry being injected with many elements of Wally’s personality. I love Barry Allen now and am totally down with him as The Flash, but it still made me a bit sad that those original Johns/Kollins comics I had been so fond of now starred a character who no longer existed. But to get back on point, the return of this pre-52 Wally West works so well because he is an emblem of what was lost with the New 52. Perhaps more than anyone else he is a standard bearer for the change and legacy the DCU was once known for. He began as a child, becoming Kid Flash. He grew into a teenager, becoming a founding member of the original Teen Titans. He became an adult, and took over the mantle of The Flash. He grew from cocky young man struggling to escape his predecessor’s shadow to a great hero in his own right, becoming so entrenched in the role in this era of temporary substitutes that, by the end of his tenure, I believe he had actually been The Flash for more years (in our time) than Barry Allen had! He married Linda Park, they had two children, who grew from infancy to being fully-formed 8-10 year olds with personalities and superpowers of their own. He lived a full life before us on the comic page. And then in an instant that was all gone because such a life couldn’t possibly exist in a condensed 5-year timeline. Reading the four-page montage in this book – masterfully illustrated by Ethan Van Sciver – where Wally chronicles his full history from Silver Age through to Flashpoint, I got chills, seeing all that stuff being referred to in a central DC comic once again. Who better to be the agent through which the events from before the New 52 are put back on the table? And that they are. For example, I never got round to reading Flashpoint, but now I absolutely want to read it, as it feels important and relevant again. Stories from before the New 52 have teeth once more. That’s not to say that the New 52 is thrown under the bus. As I said above, there has been a lot to like in the New 52 as well, and we see elements from various books picked up on here, be it the developments of this week’s issues of Justice League and Superman or references to Swamp Thing storylines from a few years ago. But in amidst that, new wrinkles are being factored in, more remnants from the world that was being brought back into the mix. Old and new all forming a ragged yet fascinating tapestry. And, to go back to more Flash talk, I loved the characterisation of Barry Allen here. We had a whistlestop tour through a lot of familiar heroes and villains, but I think The Flash was my favourite. Even the little touches demonstrating his remarkable decency and optimism, how more than any other hero it’s the Fastest Man Alive who takes the extra time to ensure the people he rescues are happy as well as safe. But on a bigger level, having him be the one figure within the New 52 Universe who can remember everything from before Flashpoint and you knows about a malevolent outside force working against them all puts him in a real centrepiece role within the DCU, poised to be a crucial figure in yet another Crisis down the line. And yes, about that malevolent outside force… that was the other thing spoiled for me in advance. It turns out that the figure behind the disruption of the New 52 is none other than Doctor Manhattan, of Watchmen fame. The characters don’t know this yet, and we are left in the dark about the specifics of how and why, but the world of Watchmen is now somehow in play within the DCU. That’s going to upset a lot of people, I know. And I am wary of disrupting that perfect, self-contained clockwork industry of the classic comic. And yet, I can’t deny that the reveal of that smiley face button in the Batcave got my heart racing even without it being a total surprise. The sheer audacity of it has sparked my interest, and I absolutely need to know how this is going to play out. Geoff Johns has successfully implanted a longform mystery into the heart of this DCU rejuvenation, with a conflict not quite like anything we’ve seen before. And even though we don’t know the specifics, the stakes are laid out: this is a battle between the bright and hopeful optimism of the DC heroes and the bleak cynicism of Watchmen. We’ll see what happens next! But in talking about all these fascinating mechanics and intriguing developments, and looking into this as a new beginning, there’s something else that’s worth pointing out. This is also an ending. For now, at least. This is Geoff Johns’ last comic for the foreseeable future, with him transitioning fully into the executive role that has been occupying more and more of his time in recent years. And in that context, DC Universe: Rebirth reads a lot like a swansong for his decorated comics career. We are taking a tour across various characters Johns has written for, touching on numerous stories he contributed to. Wally West as our guide through all this becomes appropriate, given how he was the protagonist of one of Johns’ first major DC writing gigs. And The Flash’s significance is fitting as Johns has always called The Flash his favourite character. As a writer known for his big, epic events and in particular his breathtaking setups for those events, it is fitting that his final bow be a setup for the biggest event of all, handing the reigns over to others to see it through. After giving us a Green Lantern: Rebirth and a Flash: Rebirth, Geoff Johns leaves us with a DC Universe: Rebirth. In this relaunch from DC, The Flash #1 finds itself in a position quite similar to that held by Batwoman #1. I read both titles in their previous incarnation. In the case of both titles, the main draw for me in their pre-relaunch run was stunning artwork. Both titles have their respective great artist returning to the book, but now taking on the role of writer/artist, with the respective big name writers that were previously working on the books departing. As a result, with both titles there was a question of whether the artist would be able to hold up the writing end of things. But what sets The Flash apart from Batwoman is that I had dropped The Flash pre-Flashpoint, and so this new volume had the added challenge of trying to draw me, as a lapsed fan, back into buying the title monthly. I went into this comic quite determined not to like it – with all the great titles I’ll be coming back to next month, I had already convinced myself this would just be a one-issue “sample and pass” situation – but I grudgingly have to admit that this really was good. The Flash really is a team effort. It’s co-written by artist Francis Manapul and colorist Brian Buccellato, both working together to both create the story and give it such a distinctive look. When the art team and the writing team is one in the same, it really enhances the symbiotic nature of story and image in comics in fascinating ways. I adore Manapul’s pencils. I’ve long admired his ability to create a sense of place in his work. While backgrounds seem to be a chore for some artists – even some talented ones – Manapul relishes in them, creating incredibly detailed cityscapes and varied, vibrant locations. And the people he puts in them are well drawn too, with a stylised flair. This is the stuff I already liked about Manapul’s work, but going into The Flash #1, he pushes his art to a whole new level. With intricate layouts and stunningly crafted pages (look how enthralling a page he can shape out of Barry Allen hanging around his apartment), Manapul is able to create a dizzying sense of speed and motion that marks him out as the perfect match for a character like The Flash. But a big part of what makes Manapul’s art work so well is that it’s colored by Buccellato. His colors have a brushed, almost water-color quality to them, making his pages look unlike anything else DC has to offer. The palette he uses has a warm, nostalgic glow to it that’s just pleasing to the eye, and is the ideal compliment to Manapul’s vibrant linework. So, as expected, The Flash looks great. But how’s the writing. Well, I must admit, this comic had a lot going against it going in. In the wake of the relaunch, Barry has been de-aged, his relationship with Iris annulled, and worst of all, Wally West – my favorite Flash – has been apparently erased from the history books. Readers looking to see these grievances are going to be sorely disappointed. But if you are willing to keep an open mind, and approach this title as a blank slate, there’s a lot to like. Barry Allen and his supporting cast are economically introduced, and though his new antagonist suffers from that old “Hey, it’s your dear old friend from way back that we’ve never heard about until now” chestnut, he displays some powers that should make him an intriguing foil for the world’s fastest man. Aside from that, the plotting is pretty light, but it zips along at a nice pace (appropriate for a comic starring The Flash) and it never felt like it was dragging. I’d say I’m interested enough to want to know what happens next, at least. So, The Flash #1 is an aesthetic triumph, and Manapul and Buccellato do a good enough job with the writing that the absence of Geoff Johns is not felt too sorely. I was expecting this to be a comic I’d be dropping after issue #1, but it looks like I’ll at the very least be back for issue #2. I have a friend called Sergio, and he’s a massive Aquaman fan. For the many years I’ve known him, his unwavering support of the undersea hero made him the subject of much ribbing from myself and our mutual geeky friends. And when even other comic geeks are ribbing you about your favorite superhero, you know you’re in trouble. I’ve laughed at plenty of the tried-and-true “Aquaman is lame” jokes from various pop culture sources over the years, and while I was sure he wasn’t as lame as those gags made out, he was never a character I ever felt much inclined to read about, and so – until now – I’ve never bought an Aquaman comic. 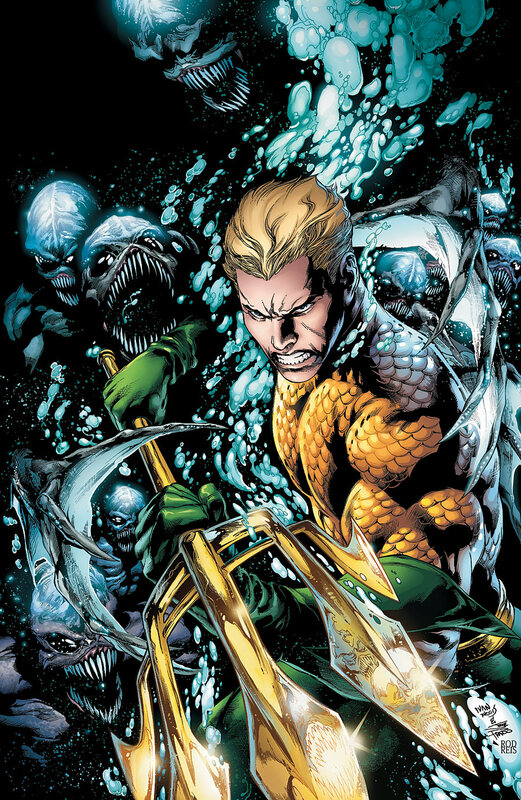 Despite all this, whenever Sergio would write about Aquaman, he’d touch on a deep and fascinating mythos full of richness and epic scope for those who cared for it, and I always thought that if an actual comic could portray the world of Aquaman with the same passion as my friend, then the character could stand to become a lot more popular. Then I read Aquaman #1. Sergio, feel vindicated: this comic’s for you. I’m not going to pretend like this relaunch of Aquaman as part of DC’s New 52 came totally out of the blue and took me by surprise. Truth be told, I’ve been at the very least curious about the title ever since the creative team was announced back in June. See, as part of DC’s ongoing attempt to restore credibility to this tenured Golden Age hero – following on from the groundwork laid in Blackest Night and Brightest Day – our buddy Aquaman was paired up with the same dream team that helped elevate Green Lantern from obscure hero punchline to A-lister: writer Geoff Johns and artist Ivan Reis. Though the work Ethan Van Sciver and other artists did on Green Lantern: Rebirth and the early issues of the last Green Lantern relaunch also played a role in elevating this fallen mythos, it was when Ivan Reis stepped onboard that we got such classic, top-selling tales as Sinestro Corps War, Secret Origin and Blackest Night, making Johns/Reis the pairing most synomonous with Green Lantern’s resurgence. Who better, then, to attempt the same trick with Aquaman? Geoff Johns has long had a talent for taking classic characters who have been around for ages, honing in on that one most enduring core quality and bringing it to the fore in a way that makes the character feel fresh and relevant. In the case of Aquaman, that enduring trait he singles out is that scorn and mockery the character has to deal with, which Johns slyly transfers from an opinion held by readers to one held by people within the DCU. Repeatedly throughout the issue, criminals, cops, and even regular citizens (particularly one internet blogger who bears a striking resemblance to Matt Fraction) make gags about how lame Aquaman is, how he’s just “the guy who talks to fish.” At first, this is played for laughs, effectively so (Johns has been stretching his funny bone a lot more since the relaunch, I’ve noticed). But as the issue progresses, this becomes a poignant statement of character. Through conversation with his wife Mera, we learn that Aquaman has chosen not to return to his undersea kingdom, as he feels like his human appearance meant the Atlanteans never truly accepted him as one of their own, even when he was their king. And thus we get a sense of what it means to be Aquaman: he works tirelessly to defend two realms, land and sea, and on land he isn’t appreciated and dismissed as the “fish guy”, while in the sea he is scorned for being too human. Arthur Curry is a man with no true home, and thus it’s appropriate that his abode of choice is a lighthouse on Amnesty Bay, on the boundary between land and sea. It’s also worth noting that it’s his father’s lighthouse. A recurring theme in Johns’ character work, particularly in his revival of Silver Age heroes, has been the long shadow cast by lost parents. That is in effect once more here, with happy childhood memories with his father seeming to haunt Arthur’s thoughts. Some words of wisdom from his father – about how he could have had the more glamorous role of ship captain, but chose instead to remain as a lighthouse keeper because it was his responsibility, and one has to live up to responsibility even when it’s thankless – seem to serve as the grounding for Aquaman even in the face of mockery and rejection from those he protects. These little flashbacks and references to Aquaman’s past were also useful for me, as I’m not overly familiar with the character’s origin. But that’s a small nitpick. Overall, some fantastic writing by Johns here. In the New 52 as a whole, I’ve noted a return to form for Johns, specifically that he seemed to be firing on all cylinders with Green Lantern #1. But Aquaman #1 is easily his best effort from this first month of the relaunch. Of course, Johns’ writing is only half of the equation. The other half lies with Ivan Reis. I was a huge fan of the stunning work he did on Green Lantern: his clean, beautiful pages were the sign of a superstar in the making. Then, his work on Blackest Night followed through on much of that early promise, showing he was more than capable of handling a massive event. But in the later issues of Blackest Night, and particularly going into Brightest Day, I felt like his work began to get more or a rough, “grim-n-gritty” look I was less keen on. Thankfully, Reis is back on top form for Aquaman #1, a fact made clear immediately from the stunning, instantly iconic cover to the issue: surely one of the best covers of the New 52. Looking inside the comic itself, the interior art is just as impressive. The action scenes are dynamic and exciting. The Trench look truly monstrous and frightening – a triumph of design. But my favorite parts of the artwork in this issue were the smaller beats, such as the silent reaction shots of various characters that really help sell a gag, or the flashes of annoyance Aquaman gives when someone cracks a joke, or – in one particularly badass moment – when a bullet grazes past his forehead. As always, the near-symbiotic relationship between penciller Reis and inker Joe Prado bears splendid fruit. Prado’s lines are fine, but have just enough thickness to make Reis’ characters jump off the page. And surely the distinct, textured look of the Trench is thanks largely to the contribution of Prado. In fact, those two opening pages where the Trench are introduced could surely be called an inking masterclass, as we’re presented with the ominous darkness of the ocean depths, then with the emergence of creatures even darker from within. I also want to acknowledge the coloring of Rod Reis, in particular as regards Aquaman’s vest. I’ve seen some people question why Aquaman has reverted to his classic costume, when his pirate look was much cooler. But the glittering, shimmering quality of Aquaman’s orange vest shows how cool the costume can be. Much like how Hal Jordan’s old duds were revitalised by injecting some glowing green, this plated (and, as we discover, bullet-proof) design looks cooler than ever thanks to Reis’ deft coloring of it. On just about every level, Aquaman #1 is a huge success. While my curiousity had been piqued, I did not expect going in that this would be DC’s best new release of the week, but it was. I’m now an Aquaman fan, thanks to this issue. And I’m sure I won’t be the only one. I think my friend Sergio is about to have lots of company. I’ll be brutally honest here: I thought this was going to be my last issue of Green Lantern. A few short years ago, Green Lantern was the comic I most looked forward to reading every month. With the help of some gorgeous artwork – from Ivan Reis, then Doug Mahnke – Geoff Johns crafted an instantly iconic expansion of the mythology for Hal Jordan, the Green Lantern Corps, and their various friends and foes, with enough mysteries and prophecies to provide endless discussion and debate, and all roads leading to the big, climactic event, Blackest Night. But post-Blackest Night, the Green Lantern franchise as a whole felt like it was lacking direction. I gave up on Emerald Warriors after a couple of issues, dropped Green Lantern Corps, and soon was only buying Green Lantern, and even that was meandering along at a casual pace, taking over a year to ultimately not do very much. Every month I would read the latest issue, find it quite enjoyable, then very quickly forget about it, with no anticipation for the next instalment. I was buying out of habit, rather than the genuine investment in the story that I’d had before. And while I liked the Green Lantern movie a lot more than some did, it still wasn’t enough to reignite my passion for the character like I hoped it might. I figured that I was buying enough comics without getting ones I genuinely cared about, and so when the news of DC’s relaunch came, I decided that I would give this new Green Lantern #1 a chance to win me over, out of respect for Geoff Johns’ earlier work on the series. But I had very little anticipation for it, and as I got round to reading the comic – as an afterthought, after getting through the releases from this week I had actually been looking forward to – I was fairly confident this would be my farewell to the series I had enjoyed so long. Then something strange happened. Green Lantern #1 totally blew me away. It was one of the best New 52 comics I read this week, and surely the best Green Lantern comic Johns has written in about two years. One of my biggest problems with Green Lantern over the past couple of years is that it has been in endless event mode. One of the things that originally made me a fan of Geoff Johns’ writing was his keen eye for character. With the Rogue profiles in The Flash, and even the earlier arcs of Green Lantern, Johns had a real talent for honing in on one aspect of a character that had always been there, and enrichening it with a humanity that made readers connect with them and care about them. But as Green Lantern jumped from Sinestro Corps War to Blackest Night to Brightest Day to War of the Green Lanterns, and the series became so much about fight-fight-fight that characters in the book were even making meta-textual gags about Hal never taking off his Green Lantern uniform, I feared the series had become a shallow read, devoid of the emotion that was supposed to be at its core. In this context, Geoff Johns did the wisest thing he possibly could have done with Green Lantern #1, the thing I’ve been wanting him to do for ages: he strips everything down to basics, draws back on the scale and scope, and makes the focus of the issue a dual character study of Hal Jordan and Sinestro. Hal Jordan has been a cipher for so long, our access character as we get dragged from cosmic set-piece to cosmic set-piece, it felt refreshing to experience him as an actual character again. And for all the complaints from certain fanboy circles that his Hal is a faultless Mary-Sue that can do no wrong, Johns actually is very brave here in just how much of a screw-up and a deadbeat he is willing to portray Hal as. He might be the greatest Green Lantern of them all, but without the ring, back on Earth, he isn’t very good at being Hal Jordan. He can’t pay his rent. He can’t hold down a job. He can’t get a lease on a car. And he has a habit of letting down the few people left who care about him. Johns wisely sets much of the action of this first issue on Earth, and in the real world, being a fearless hero isn’t always enough to get by on, and sometimes can even work actively against you. Carol offers Hal good advice when she says that “most jobs are jobs”, and that he should take her offer for a non-pilot job at Ferris Air because most people have to settle for work that doesn’t offer the pride and the glory, but we don’t know if it falls on deaf ears. Geoff Johns takes all that time he had Hal Jordan spend as Green Lantern without respite towards the end of the last volume, and makes it a statement of character: Hal Jordan is Green Lantern all the time, because nowadays that’s just about all he can do. But the descent of Hal Jordan is juxtaposed with the rise of Sinestro. In our opening sequence, we see Green Lantern’s arch nemesis reluctant to rejoin the Green Lantern Corps. 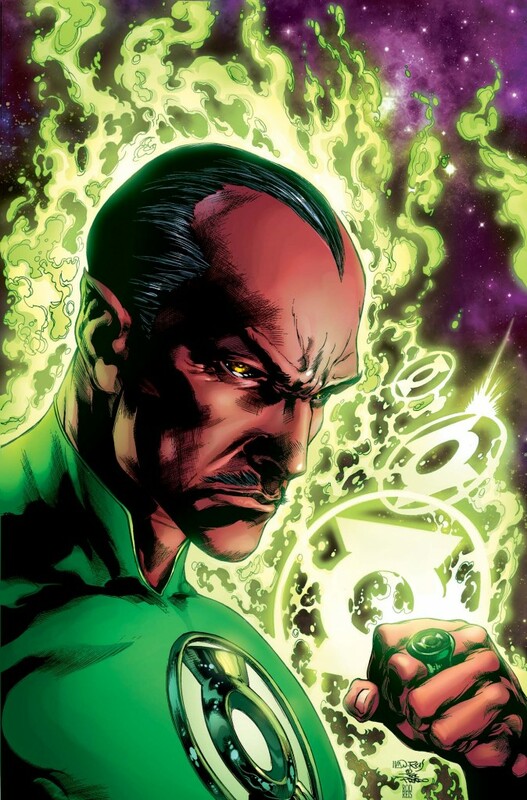 Long the most nuanced character in the series, Sinestro was a villain who felt his actions were justified, that he was always acting in the interest of a greater good. Now, he is being given a chance to put his money where his mouth is, and in this first issue at least, replace Hal as the cover hero, and the Green Lantern of the title. For now at least, he seems to be taking to the role like a duck to water. One sequence where he makes short work of a former Sinestro Corps compatriot allows him to be an el primo badass, while a small touch like him destroying the yellow ring before it can seek out another host demonstrates the knowledge of a veteran, showing how he once earned his reputation as the greatest Green Lantern of them all. Sadly, Carol Ferris isn’t so well developed. The previously mentioned moment where she advises Hal on his life choices works well, but in her later appearance, she seems to default back to the marriage-obsessed harpy of the Silver Age, with a totally unreasonable reaction to her incorrect assumption that Hal was about to propose to her. Why would she even be expecting him to propose? Isn’t he still in a relationship with Cowgirl? Or since we haven’t seen her in years, are we to accept that she has been sent off to Grant Morrison’s lonely planet of forgotten characters? If Carol fails to convince as a love interest, it is perhaps understandable, as Geoff Johns’ Green Lantern saga is surely an epic love story between Hal Jordan and Sinestro. If his run doesn’t end with the two of them kissing against the sunset, I will be sorely disappointed. Resuming his art duties on Green Lantern is the always reliable Doug Mahnke. We know this guy can draw crazy monsters and aliens in his sleep, and he gets to do a little bit of that here, but in this issue he gets to demonstrate how he can also excel in the quieter moments, showing how the smallest flickers of emotion can alter the dynamics of a conversation, saying a lot even when the characters say nothing at all. There you go, the book is about emotion again! And Christian Alamy’s crisp inks give the book a very clean, precise aesthetic. But I also want to take a moment to give credit where due to colorist David Baron. For a comics colorist, Green Lantern has to be one of the best gigs you can get, because it is a series where color is at the forefront, where each shade and hue is packed with symbolic power. The glowing green of the Green Lantern costume, ring, battery and constructs is as striking ever, seeming to glow from the page. But also of note is the occurence of green on the Earth-based scenes, or lack thereof. All of a sudden, Hal Jordan’s world is devoid of green, making the periodic flashes of it relevant. In his apartment (which he’s ultimately evicted from) he is standing on a small patch of green carpet, which the landlord is encroaching on. And at the moment where he mistakenly believes he can be a hero again we get little mocking emerald flashes – the curtains in the apartment across the street, even the color of his underwear sticking up from under his jeans. And as well as green, there’s yellow, the color of fear. From the envelopes of the unpaid bills to the decor of the restaurant he takes Carol to, yellow seems to be closing in all around Hal Jordan. And near the end, when it hits him how wrong his life has gone, Hal’s face is cast into shadow, and behind him is a stark yellow background. Some great work from Baron. So, in the case of this series, the DC relaunch did its job. Green Lantern has a new lease of life. I thought this would be my last issue, but my interest in the character and the mythology has been revived. I’m back onboard, Geoff. I hope what you’ve got coming in future issues is able to keep me there. Justice League #1 is a comic with a lot to carry on its shoulders. Most obviously, and what we’ve heard a lot about, is that this is the book that marks the dawn of a new era for DC Comics. This week, only two DC comics shipped: Flashpoint #5, the end of old DC, and Justice League #1, the beginning of new DC. With all of DC’s outreach to new and lapsed readers over the past few months of marketing, this is the comic DC are hoping to use to sell their universe. This is the first shot, the opening salvo, and this prestiguous position has resulted in making the comic one of the biggest successes of 2011 even before its release, with retailers ordering north of 200,000 copies of the book. With this aspect of the anticipation of the new Justice League so grand in scope, it’s easy to forget the other, longer-brewing goal this must strive to meet. It has been many years since Justice League of America has been a comic that has enjoyed particularly noteworthy critical or commercial success, or been anywhere near the centre of the DCU. I remember Dwayne McDuffie being vocal in his complaints about the comic freewheeling from event tie-in to event tie-in with no chance to build any momentum or identity of its own, and how long has it been since his run on the title? It’s only got worse since then, with a hodgepodge roster of B-and-C-listers and legacy characters filling out the cast of a comic that has been shunted to the fringes of the DCU. Meanwhile, over at Marvel, The Avengers has long been a central lynchpin brand that has proven capable of generating impressive sales and sustaining multiple titles each month, and is going to be the basis of what is set to be one of the biggest films of 2012 and one of the biggest superhero movies ever. Their DC counterparts have sorely needed to play catch-up. 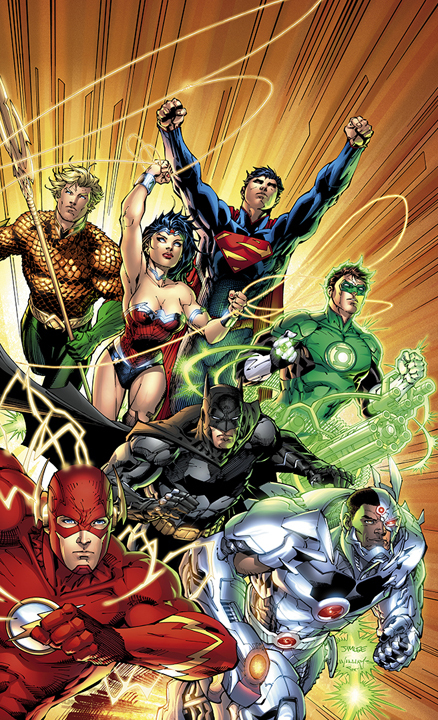 It seems like for years, the rumor has floated around that Geoff Johns and Jim Lee would be teaming up to put together a proper A-list roster with DC’s most iconic heavy hitters, and make the JLA a crown jewel in the DC lineup once more. And it made sense: DC’s biggest team should be written by its biggest writer and drawn by its biggest artist. Now, we’re finally getting that long-desired Johns/Lee JLA project, but it’s called Justice League, and it is the bedrock of a relaunched DCU. Can Justice League #1 possibly live up to all that crushing expectation? Before I get to tackling that big question, I’ll start by saying this comic looks great. It’s been a long time since we saw a new comic from Jim Lee, but amidst all the complaints of his tardiness its easy to forget how nice his pages are when we do get them. Visually, DC’s co-publisher is the perfect choice to brand the new DCU in its first foot forward: presenting a world that’s clean, slick and stylish. But deserving just as much credit as Jim Lee is colorist Alex Sinclair. It’s the bright, crisp colors that really make each page pop. This is a world that is fearful and suspicious of its new protectors, and that is reflected in the color scheme, as the darker palette is almost invaded by bright, dazzling bursts of light whenever the superhumans are around: be it the glowing green of Green Lantern’s constructs, the blinding red of the Parademons’ feiry projections, or the red and blue blur that marks Superman’s entrance. Batman, meanwhile, seems to always find some shadow to sink into, a moody contrast to the dazzling palette of the rest of the book: a triumph for inker Scott Williams. In terms of the writing, I had some problems. I cast my mind back to Grant Morrison’s first issue on Justice League of America. This too was a new #1, and this was also an attempt to bring DC’s biggest heroes back together after a period of lesser known heroes filling the roster. But with Morrison’s debut, we were instantly launched into a story epic and ambitious in scope, and concisely (re)introduced to every member of the roster (save for Aquaman, who would show up later) in a manner that efficiently established their respective powers and personalities. Coming into this new Justice League #1, this was one of the benchmarks I was set to compare the issue to. The other was some of Geoff Johns’ own famous “chapter ones”. The Sinestro Corps War Special. Infinite Crisis #1. Blackest Night #1. If there’s one thing Johns can do really well, it is start an event in a way that really lays out the stakes and scope of the story ahead, while also providing a tether of human drama with fine ensemble work. And, in my opinion, this is what Justice League needed to be presented as: an event. We don’t really get that here. I don’t see this as a major spoiler, as I won’t go into specifics, but all that happens in the issue is that Batman and Green Lantern fight a Parademon, talk for a bit, then meet Superman. This amount of story would probably fill about 2 pages of an average issue of The Sixth Gun. I may be misremembering some of the marketing, but didn’t Dan Didio and co. make a big deal out of putting an end to decompression and writing for the trade, and instead providing comics that were full, satisfying experiences on an issue-by-issue basis? This is a classic case of decompressed storytelling, and new readers might be disappointed to pick up Justice League #1 only to discover that half the characters on that snazzy cover don’t even appear in this issue. As a typical comic, or even a regular launch of a new volume, the story is fine. But as the dawn of a new era, it fell short of my expectations. Setting aside my expectations, however, I can appreciate that the thinking behind Johns’ plotting of this issue is actually pretty sound in its own right. Johns has said in recent interviews that a major priority for him in writing Justice League was to showcase the distinct personalities of each member, making their group dynamic and interactions a crucial part of the title rather than it simply being plot-driven. Bearing this in mind, perhaps it makes sense to play it slow and steady with how the characters are introduced over the course of this opening arc. And it’s also clever when you consider the order of chaacters introduced, as far as appealing to new readers: Batman and Green Lantern are the two characters who have currently ongoing film franchises (one admittedly enjoying more critical acclaim than the other), while Superman has a new movie due in a couple of years. So, start with the characters fans who have never picked up a DC comic might be most familiar with, and build from there. With most of the issue devoted to just Batman and Green Lantern, we get plenty of time to get reacquainted with each of them. Johns gives us a wonderfully badass Batman, brooding and intimidating, but also with a droll, deadpan sense of humor. So many writers depict Batman as deadly serious, so it’s all the better in the depictions when you get flashes of sarcastic wit behind the straight face. Green Lantern, meanwhile, has his cocky demeanour heightened and brought to the fore, with his occasional habit of referring to himself in the third person garnering some chuckles. He’s going to be the hothead of the group, and while some people are complaining about Green Lantern being depicted as too arrogant and stupid, these are largely the same people who were complaining about Green Lantern being dull, stoic and faultless a couple of months ago, and I don’t see a problem with it. Also, it was a nice touch how some of the mythology of the Green Lantern Corps was worked into the dialogue, rather than taking it for granted people would know who Green Lantern is. Superman has less panel time, but there’s some skillful work done at establishing him through how other characters perceive him before he first appears. It adds a layer of mystery and unpredictability to that most safe and familiar of characters. And though he’s not Cyborg yet, we do get an intriguing subplot involving Vic Stone. There’s been some complaints about Cyborg’s place in the Justice League being mainly just to tick the diversity box, that he isn’t a compelling enough character to justify the placement. Well, it would seem that this opening arc is going to play against the backdrop of something Johns has long been very skilled at: getting to the core of characters and really making us care about them. So, under the weight of all that expectation, Justice League #1 might not quite match up. But if you cast aside that expectation, and take it just as a Justice League comic, Geoff Johns and Jim Lee give us a first issue that offers much to like. I think that a lot of people who picked this up will be back for issue #2.